This 16 page PDF contains lots of photographs, detailed written instructions, links and tips should they be needed to help you along the way. 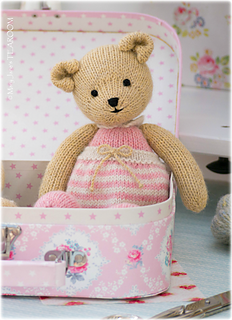 Little girl bear has been created using 3 shades of standard DK weight yarn for both body and clothes…. 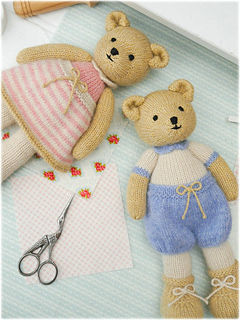 Bear head and body is stuffed as you knit and so is complete when knitting is complete. 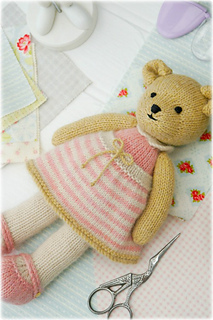 Dress (skirt) is seamless and it would be easy to knit in different colours. 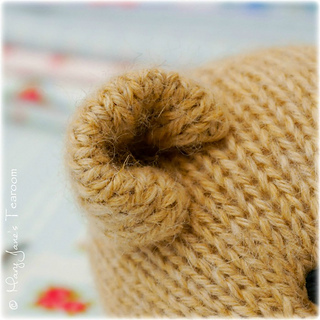 A basic understanding of knitting ‘in the round’ is required for the pattern. 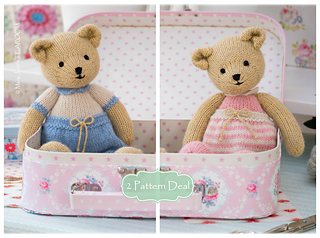 Detailed step by Step Instructions, photographs, useful tips and help links. You are welcome to contact me at any time for help and advice…. 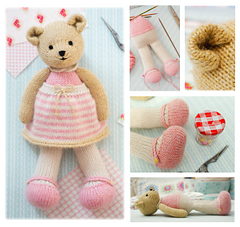 Mary Jane’s TEAROOM designs are only available in Mary Jane’s TEAROOM Stores online.